If Antarctica lives on in our minds as perhaps the most distant and otherworldly of all Earthly environments, than it is all the more remarkable to see how, in recent years, it has itself become a privileged vantage point from which to observe and research other worlds. Indeed, for astronomers, Dome Argus (Dome A), the culminating point of the East Antarctic ice sheet, has the potential to be the best location on Earth for astronomical observations. The challenge is that the same environmental conditions that make it so attractive, also make it one of the most difficult and expensive locations in which to install and operate high precision astronomical instruments. What astronomers need above all are clear skies (free of dust, light and other pollutants), a stable surface on which to set up the instruments, a very thin and stable turbulence layer (the layer of the atmosphere closest to the ground), and very low water vapour (or humidity). Such locations tend to be in remote desert areas, and Dome A, located 1,200 kilometres inland, near the centre of the Earth's most isolated continent, is certainly the remotest of them all. As discussed in other articles, its environment is extreme, with an altitude of 4,094 metres (air pressure close to 5,000 metres), and winter temperatures that can drop to bellow 80 degrees centigrade. With the new research station to be built by China at Dome A, however, what seemed like fantasy is now closer to becoming a reality. 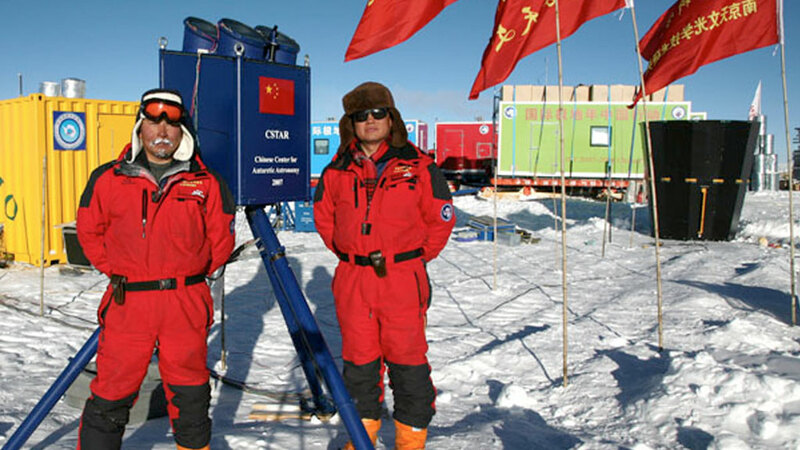 Already last austral summer, piggy-backing on a Dome A surveying expedition, the newly created Chinese Centre for Antarctic Astronomy (CCAA, which groups together astronomy departments at the universities of Beijing, Nanjing, Tianjin, and China's Purple Mountain Observatory), worked in collaboration with the University of New South Wales (UNSW) and the Polar Research Institute of China (PRIC) to set up a remotely operated observatory, PLATO, aimed at measuring and testing the different parameters and quality of the Dome A site - and how it compared to the South Pole and Dome C.
Like Dome A, both the South Pole and Dome C are located high up on the East Antarctic Ice Sheet, but at significantly lower altitudes (2,835 metres for South Pole and 3,220 metres for Dome C). At the South Pole, the US has recently deployed a 10 metre radio telescope next to their Amundsen-Scott research station, and Europe and Australia are also taking steps to set up an astronomical observatory at Dome C, next to the Franco-Italian Concordia Station. Built in collaboration with UNSW, with some instruments provided by the California Institute of Technology and the University of Arizona, PLATO consists of a range of specially adapted devices to measure parameters including the turbulence layer, light emission by such objects as the moon and auroras, cloud cover and distribution, surface stability, and transparency "noise" levels. Perhaps most notably, one of these instruments, CSTAR, is a very small 4 wave-band optical telescope built by CCAA: Only operational at night, optical telescopes are notoriously delicate and difficult to transport. By all accounts this is the first such telescope ever to be deployed and tested in Antarctica, or at such low temperatures. After one winter of autonomous operation, data gathering, and transmissions back to Australia and China, PLATO will undergo an overhaul and maintenance programme to be carried out by Dr Xuefei Gong, one of the 28 man team traversing to Dome A this austral summer. Dr Gong's demanding programme will include the downloading of data not previously transmitted, fine tuning instruments that may have been affected by the extreme conditions, repairing and replacing malfunctioning components, and preparing the observatory for next winter, including refuelling the small generator used to power it. But already, preliminary results obtained by satellite transmission indicate that Dome A is indeed an exceptional site: One that surpasses even the South Pole and Dome C, with extremely low water vapour, a very thin turbulence layer (just 10 metres), clear skies, and the near total absence pollutants (such as light in the winter time). Furthermore, the CSTAR optical telescope was able to obtain 17 magnitude star visibility (10,000 objects per picture), as opposed to 13 magnitude for the same telescope when operated in China. Whilst more data needs to be scrutinized, the future aim is to set up a range of complimentary, and progressively larger telescopes at Dome A, in collaboration with the US and Australia. These will include a mix of both optical telescopes which will only be able to be used during the polar night, and sub-millimetre (or radio) telescopes which will be operational all year round. In the first instance, perhaps as early as 2010, the plan is to install three 50cm optical telescopes (AST3) of the same kind as the ones already being tested at Dome A, but on a significantly larger scale, and with a price tag of some US$ 5 million (30 million RMB). These three telescopes will each be mounted on a superstructure to raise them above the turbulence layer and will be operated remotely whilst Dome A station is still summer only. Further down the line, in what is a much more ambitious ten year perspective that will probably require the Dome A station to be operational year-round, CCAA is working on building a US$ 50 million (300 million RMB), 4 metre optical telescope, with a similar design to the 4 metre LAMOS telescope recently constructed in China. With an optical view of 5 degrees (ie: very wide), this instrument will be used for survey work, and should eventually be complemented by a 4 meter field telescope with a much smaller optical view - and thus designed for more precision oriented work and observations. Finally, in order to take advantage of Dome A's extremely low water vapour levels (so suited to this kind of instrument), CCAA has even more ambitious plans to install a 30 metre sub-millimetre radio telescope, similar to the one just built at the South Pole, but three times bigger. What is all this for? At Dome A, China and its international partners hope to "see" more clearly and push back the boundaries of out knowledge of the universe on such fundamental questions as supernovae (exploding stars) and dark energy, the search for remote and possibly life harbouring planets, the study of asteroids and variable stars, as well as other questions which will inevitably arise: Questions which may seem remote from our daily lives, but which, in the most instinctive and fundamental way, drive us to the edge in search of greater understanding. The future aim is to set up a range of complimentary, and progressively larger telescopes at Dome A.